This article is about the church in Montreal. For the church in Green Bay, Wisconsin, see Saint Joseph's Oratory (Green Bay, Wisconsin). Saint Joseph's Oratory of Mount Royal (French: Oratoire Saint-Joseph du Mont-Royal) is a Roman Catholic minor basilica and national shrine on Mount Royal's Westmount Summit in Montreal, Quebec. It is Canada's largest church and claims to have one of the largest domes in the world. The basilica enshrines a statue of Saint Joseph, which was authorised a Canonical coronation by Pope Pius X on 19 March 1910 via Cardinal Vincenzo Vannutelli (extinct) and another from an Apostolic brief dated 9 July 1955 by Pope Pius XII who crowned the new statue on 9 August 1955 via Cardinal Paul-Émile Léger now located within its crypt department. The shrine is also famous due to its association with Brother Andre Bessette who was believed to possess healing powers through his Josephian devotion with its notable oil ointment given freely to its believers. View of the dome under construction in 1937. Father Paul Bellot, an architect, completed the dome of Saint Joseph's Oratory between 1937 and 1939. In 1949–1951, architect Gilbert Moreau carried out alterations and improvements to the interior of Saint Joseph's Oratory, as well as to the adjacent monastery, and rearranged the sacristy in the basilica. André Bessette is at the origin of the Oratory. The basilica is dedicated to Saint Joseph, to whom Brother André credited all his reported miracles. These were mostly related to some kind of healing power, and many pilgrims (handicapped, blind, ill, etc.) poured into his Basilica, including numerous non-Catholics. On display in the basilica is a wall covered with thousands of crutches from those who came to the basilica and were purportedly healed. Pope John Paul II deemed the miracles to be authentic and beatified Brother André in 1982. In October 2010 Pope Benedict XVI canonized the saint. A reliquary in the church museum contains Brother André's heart, which he requested as a protection for the basilica. More than 2 million visitors and pilgrims visit the Oratory every year. It is located at 3800 Queen Mary Road, at Côte-des-Neiges (between the Côte-des-Neiges metro station and the Snowdon metro station). Composer Émilien Allard notably served as the church's carillonneur from 1955 to 1975. For RCA Victor he released the LP album Carols at the Carillon of Saint Joseph's Oratory for which he wrote the arrangements. On October 19, 2004, the Oratory held its centennial. 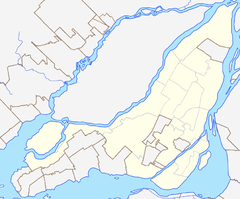 All the bells of all the churches on the island of Montreal were supposed to ring at 9:00 a.m., though not all churches participated. At 9:05 a.m., the basilica rang its bell in response and celebration. On 2 April 2004 Canada Post issued 'Saint Joseph's Oratory, Quebec' in the 2004 Tourist Attractions series. The stamp was designed by Catharine Bradbury & William Stewart based on a photograph by Bernard Brault. The 49¢ stamps are perforated kiss cut and were printed by Lowe-Martin Company Inc.
On October 30, 2007, Father Charles Corso, a priest at the Oratory, was faced with a disorganized and depressed man who threatened to kill himself with a handgun. The priest talked with the man and managed to calm him down before police arrived on scene. The man was brought to hospital to undergo psychiatric evaluation. On March 22, 2019, a 26-year-old man wearing a dark winter coat and light-coloured baseball cap entered the Oratory during the Friday morning mass, rapidly walked up to the centre, and stabbed the celebrating priest, Father Claude Grou. Of the fifty people attending mass, several intervened to neutralize the assailant, before security guards responded. Police officers from the Service de police de la Ville de Montréal quickly arrived on scene and arrested the assaillant who was already detained by security personnel. The assaulted priest suffered only minor injuries, a single stab wound to the chest. That same evening, upon being wheeled out of the Montreal General Hospital, he said, "My health is fine. I’ll take a little rest and I will be back to work when my rest is taken. And the Oratory will remain a place where people can be welcomed. A place of prayers, and a place of calm, and a place of peace - even if there are some moments like that." ^ "Bellot, Father Paul in Biographical Dictionary of Architects in Canada 1800–1950". Retrieved November 16, 2011. ^ a b Pound, Richard W. (2005). 'Fitzhenry and Whiteside Book of Canadian Facts and Dates'. Fitzhenry and Whiteside. ^ "Moreau, Gilbert in Biographical Dictionary of Architects in Canada 1800–1950". Retrieved November 16, 2011. ^ Saint Joseph’s Oratory of Mount Royal National Historic Site of Canada. Canadian Register of Historic Places. Retrieved August 17, 2011. ^ a b c d e Gould, Kevin; Luft, Amy (March 22, 2019). "Priest stabbed at Saint Joseph's Oratory says he looks forward to returning to work". Bell Media. CTV News Montreal. Retrieved 23 March 2019. ^ Lau, Rachel (March 22, 2019). "Priest transported to hospital after stabbing at Saint Joseph's Oratory". Corus News. Global News. Retrieved 23 March 2019. ^ Olson, Isaac (March 22, 2019). "Priest stabbed during morning mass at Montreal's Saint Joseph's Oratory". CBC/Radio-Canada. CBC News. Retrieved 23 March 2019. ^ "St. Joseph's Oratory stabbing: 'People will come to pray for Father Grou'". Postmedia Network. Montreal Gazette. Retrieved 23 March 2019. Wikimedia Commons has media related to Saint Joseph's Oratory of Mount-Royal.